Review: "Poland, Chris: Return to Metalopolis 2002" - Sea of Tranquility - The Web Destination for Progressive Music! As the original guitarist for Megadeth, Chris Poland played on the seminal thrash band’s first two albums (Killing Is My Business … And Business Is Good! and Peace Sells … But Who’s Buying?) before being kicked out by Megadeth founder Dave Mustaine (reportedly for substance abuse). Poland then retreated to the underground, and in 1990 he released his first solo album, the aptly titled Return to Metalopolis — an underrated instrumental metal album laced with mind-boggling shredding and a rhythm section that sounds as crisp as it does tight. Poland plays all guitars and bass, while his brother, Mark, plays drums. It is melodic, fluid, heavy and thrilling. But above all else, it offers more … so much more … than either of Megadeth’s first two records. 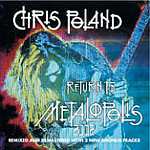 Return to Metalopolis 2002 is a remixed version of Poland’s 10-song debut, plus two bonus tracks (the thick and chewy "30 Days Due" and the 14-and-a-half-minute "Heavy Guitar Jam," a live rehearsal session recorded in 2001). Not only does Poland’s fluid playing cover the metal spectrum, but he also titles his songs with intriguing names like "Club Ded" (a nod to his former band), "Heinous Interruptus," "Row of Crows" and "Beelzebub Bop." What makes Return to Metalopolis an even more compelling record is the fact that Poland severed many of the tendons in his left hand after being shoved through a plate-glass door while in high school. As a result, he is unable to bend the last joint of that hand’s index finger — a vital digit when playing bar chords and performing other techniques. Hence, Poland’s sound, which can be likened at times to Joe Satriani and David Chastain, possesses a distinct tone and original identity that makes Return to Metalopolis a thoroughly mesmerizing listen. Note: Since the original release of this album, Poland has played with bands like Damn the Machine and Mumbo’s Brain, and his current project is a power fusion/rock trio out of Los Angeles called Ohm.